ARABIC was for long the unchallenged language of Islamic extremism. Its speakers far outnumber any other linguistic group. Arab lands are the most fruitful recruiting grounds. Without Arabic, tyros may struggle at training camps and on the battlefield. And fluency implies piety: the language of the Koran also connotes learning and wisdom. 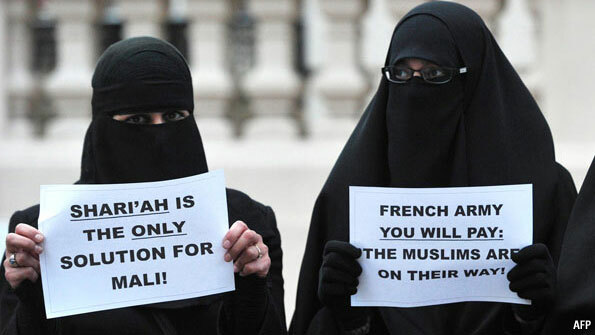 But the once monoglot world of jihad is increasingly multilingual. Al-Qaeda has long advocated the creation of self-starting, independent terrorist cells. Materials are being produced in the language of any part of the world that has a Muslim minority and thus potential sympathisers, says Thomas Hegghammer, an expert on violent extremism. Translations are appearing in the languages of countries where jihadist leaders want to see further activity. In his 1,600-page opus, “The Call to Global Islamic Resistance”, released in 2005, Abu Musab al-Suri, an al-Qaeda strategist, called for jihadi materials to be released in other tongues, including English. Over the past ten years grassroots activists who connect with each other online have published ever more on the internet in an ever greater variety of languages, says Aaron Zelin, a research fellow at the Washington Institute for Near East Policy, who runs a website called Jihadology. Groups such as Fursan al-Balagh Media and Al Qadisiyah Media (which specialises in Asian languages such as Bengali, Hindi and Urdu) translate jihadi propaganda. In one document Abu Musab Abdel Wadoud, leader of al-Qaeda in the Islamic Maghreb, warns Western powers considering action in Mali: “If you want it [sic] a war then we will meet your desire and the Great Sahara will be the grave of your soldiers and an annihilation for your money, Allah willing.” Organisations such as the Global Islamic Media Front, a virtual entity, then vet such stuff and distribute it. The international version of Ansar al-Mujahidin, a big online forum, is a clamour of different languages. English is foremost, but publications are also available in Albanian, Bosnian, Filipino, French, German, Italian, Pushtu, Spanish, Urdu and Uighur. Militant groups need to reach enemies as well as possible friends. Threats lose their impact if the infidels do not understand the scolding. On the Ansar forum an al-Qaeda statement condemns the intervention in Mali of “crusader France” and threatens retribution—in French as well as English.